What in your surroundings is most important to you? List 10 things. Did air or water or trees make the list? Chances are they didn’t - we often take them for granted. Air, water, and land are increasingly being filled or contaminated by the things people throw away. In the past, reducing, reusing, and recycling were ways for people to save money. Your great-grandparents reused glass bottles and sewed up the holes in their socks because their money went to keeping a roof over their heads and food in their stomachs. Today, people “reduce, reuse, and recycle” for many reasons. Biking or walking reduces air pollution, saves money, develops leg muscles, and promotes a healthy heart. Second-hand stores sell cool, inexpensive clothing that others have outgrown. Using red wiggler worms to eat your kitchen waste will create a rich fertilizer for your plants and reduce the amount of garbage you throw away. Everyday decisions add up to big impacts on the environment. Often, the choices we make to preserve the environment also create a lifestyle that is less expensive and healthier for us. So choose to recycle! Reduce, Reuse, Recycle! Activity 1 – Spend Some Time With Garbage!!! How much garbage do you create? For one week, collect all of your family’s garbage in garbage and recycling bags. At the end of the week, weigh your garbage and chart how much your family accumulated. Now find out national averages about garbage and compare your family’s accumulation to the national average. Next, find out where the garbage goes once it leaves your house. Write five paragraphs about your research findings on garbage. Be sure to conclude with your vision for the future of garbage. First, take a home recycling survey: http://www.dnr.state.wi.us/recyquiz.htm. Next, think of ways to reduce your waste. What can you reuse? What can you recycle? What can you reduce? What can you rethink? What materials are recyclable? Create a list of recyclable materials and find the major groups that are recycled. This is a useful link: http://www.metrokc.gov/dnr/kidsweb/master_list.htm. After making your list, try making choices between recycling, composting, charity, or true garbage. Instead of throwing something away, think of a creative way to reuse it. Choose recycling! Choose composting! Choose charity! Choose reuse! How can you engage your school or your community to appreciate the benefits of recycling? Take a close look at the recycling symbol. How could you modify or alter it to attract more attention to recycling and the benefits it could bring to your community. 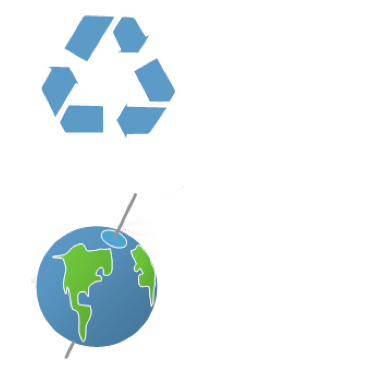 How could a redesign of the recycling symbol build specific identity for your community? Interview people in your community showing the recycling symbol. Create a survey for them. Ask them if it is motivational for their recycling purposes or informational about what should be recycled and the benefits of recycling. Use design thinking and word webs to brainstorm ideas. Develop three to five alternatives. Present them to your city’s recycling business. Be a sustainability entrepreneur! Name the areas that hold our noncombustible, non-recyclable materials, as well as ash from incineration and residues from recycling. 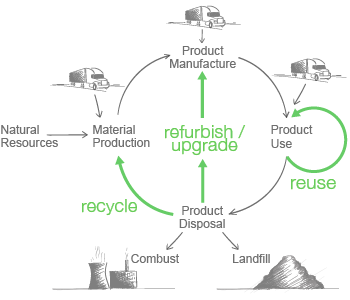 Reuse creates less of what when making a new or recycled item? You can do your part in helping the recycling by sorting what materials? Video Get In the Scrap!